Bheki Mseleku (1955-2008) was a self-taught jazz pianist and saxophonist from South Africa, who brought his own distinctive style to the international jazz world when he came first came to Europe in the late 1970's. Collaborations followed with Charlie Haden, Joe Henderson, Pharoah Sanders, Billy Higgins, Elvin Jones and many others, until his untimely death in 2008. LondonJazz News: When and how did you first meet Bheki Mseleku? Gareth Lockrane: It’s quite strange. looking back, because as a kid I learned Mseleku’s tunes and I’d always loved his music, initially because of the flute playing on all his albums - I’d basically buy anything with Eddie Parker on it – Eddie was the flautist on Mseleku’s album Celebration, and my flute teacher, who studied music at York like Eddie, encouraged me to listen to him. So as a result, I really got into Bheki’s albums while I was still living in my hometown of Leek in Staffordshire, and I carried on playing them all through college in London. I didn't see any of his legendary residency gigs at Ronnie Scott’s in the late 80s but I did come down to London with my mum and some mates to see him play at Jazz on a Summer’s Day at Alexandra Palace when I was about 16. He was playing with Denys Baptiste and Marvin ‘Smitty’ Smith on that occasion. Then around 2003/4 I met his manager, a guy called Reg Hendrickse, who was one of Bheki’s oldest friends. Bheki was in London and Reg brought him down to a club on the South Bank called Shino’s where I was leading a weekly jam session at the time, and that’s when I first met Bheki face to face. Then a year or so later I got a call from Reg and he asked me over to this huge orchestral rehearsal space that Eugene Skeef had in Borough – Eugene was also a very close friend of Bheki’s and I remember that day really well – it was a real ‘welcome to Bheki’s world’ moment. Bheki just sat me down and had me learn his tunes by ear, not a sheet of music in sight, while Eugene filmed the whole two hour long duo session. It wasn’t so much an audition, more a case of Bheki trying to find out if I was enough of a kindred spirit. In my mind there was no question - I was over-awed to be playing with him for the first time and totally up for playing in his band. LJN: What is it about Mseleku’s music that you find so appealing? GL: Bheki had it all. He was massively creative, he embraced all musical traditions and cultures, and there’s a spirit and personality in his work that’s stunning. It’s proper writing, where each tune has its own identity, even if it’s unashamedly simple. He had a god-given gift for a simple memorable melody, but having said that, overall there’s definitely a complexity to his music – he had a taste for huge forms and long expansive writing. He was also drawn to cyclic harmony sequences but there’s always a defining hook or a fantastic melody worked over the top, changing through all the keys. On a good night he’d tear into Giant Steps at some point – and then you’d know he was enjoying himself. Coltrane and Tyner were big influences, and there was a particular Jarrett tune he liked to come back to. A gig with Bheki was a tough call for the players but the audience would always sing along because they found Bheki’s tunes so memorable. The other appeal for me personally was that Bheki always wrote tunes that work well for flute – his pieces have a natural vocal phrasing in just the right register, almost as if they’ve been written for flute, with lovely singable melodies. Sometimes at gigs, if he felt really relaxed he’d sing a top line of his voicings with this nasal Zulu-like cry that would cut through the band and give it an extra emotional intensity. He had two fingers partly missing on this right hand, so his voicings were quite unique too – he used the stumps as well, and loved to give any harmony a really dark, altered sound. I think by changing it in that way he found incredible flexibility inside a tune, he was always searching for new ways of thinking about stuff, even his own music – sometimes on gigs if I found some fresh angle in my improvising he would respond straight away and shout across ‘yeah man’ and then in the next chorus he’d do the same, getting fresh inspiration himself – he was always listening. LJN: What was he like to work with behind the scenes? GL: Working with Bheki is definitely closest I’ve been to a true genius figure. We had a lot of old-school intensive rehearsal sessions and Bheki was relentless in bringing new tunes to the table – he had no piano of his own at that time and so he’d come over to my place and we’d have these long intense playing sessions – all off the cuff with no music. It was a real rite of passage for me – I became the transcriber of his tunes, which was Eddie Parker’s role in the band previously – and whilst some players might have found that quite a burden, I loved it. I’d video his fingers during rehearsals to get his voicings down. He had set arrangements in mind for his tunes, but he’d always extend sections and vamps or add beats to a bar if he felt it needed it. He was always stretching out on vamps to evolve new vamps, and he’d just keep doing it until the rest of the band realized what was going on. Despite being this genius figure, Bheki didn't project a massive ego - he somehow brought a sort of meditative healing force to the group, and was never overly pumped up for the sake of it – he could burn with anybody, but a lot of time he’d be trying to ground things, or play really soft - he truly was one of those orchestral piano players who liked to use the entire keyboard and the whole dynamic range. LJN: Looking back on the time you were playing regularly together, is there a particular gig that stands out? GL: I played with Bheki from 2005 up to when he died in 2008, and we did a lot of different gigs with various lineups, as well as quite a few duo gigs. I think however it’s the monthly gigs we did at the 606 that I remember most – Steve Ruby had known Bheki from the old days and so there was always this sense that people had come down to support Bheki when we played there – Steve Williamson, the Watkiss brothers, and Julian Joseph (who I remember sitting in one time), and they all knew all Bheki’s tunes back to front. LJN: What do you think is the kernel of his legacy? GL: Two of Bheki’s early albums are classics – his first Celebration (1991) and his first on Verve, Timelessness (1992)– they’re both strong documents of what he did. Although on his final album, Home at Last, there are more specific references to township music, which is really him. The thing they all have in common is the way he always took tunes on a journey. Of course, his legacy is tragically incomplete. We were due to record an album of all the tunes we’d played a lot on gigs but he’d never recorded. In the last few months he was really up and down health-wise and couldn’t play piano for more than about 10 minutes – he basically lost all his energy. LJN: Has Bheki affected your teaching as well as your performing and writing? GL: Yes definitely. I’ve done his tunes with my students – like Angola and Timelessness – and the kids love them. But it’s more his insistence on learning things by ear and playing stuff that’s not written down in front of you that’s influenced my teaching, mainly because it gave me another connection to playing – it’s as if there’s a whole repertoire that burbles away inside you. LJN: What do feel your role is now with Bheki’s material and legacy? GL: I’d like more people to know about his total commitment to music – I can’t imagine anyone with the more dynamism. So the main thing is to put all these unrecorded tunes out there, to pool them together into some sort of archive so people can access them and know who he was and what he represented. LJN: How would you define Bheki’s lasting impact on you personally and what is it that you most miss about working with him? GL: I wish I could play with Bheki now because I feel like a more well-rounded player now. I’ve had lots of great partnerships but working with Bheki was the ultimate in visceral performance with a consummate musician – where there’s a deep connection with the listener but it’s musically strong at the same time. Probably the thing I carry with me always is the mental picture of what it felt like to play with Bheki – he gave me the experience of what playing music should feel like – simple as that. It was like playing with one of the greats. I was still young and getting hung up on things when I met him and then I was thrown into this world of using both sides of the brain at once. Just the feeling of knowing you’re completely synching up with someone else when you’re playing – that’s what I’m always trying to get back to whenever I’m playing, especially when it’s with someone else’s band. He made me realize it’s about trying to get inside their world to try and find your place there – whether that means tipping your hat to certain genre things, or learning what to avoid, but beyond that trying to get a handle on what the intentions of that band really are and where the composer’s coming from. LJN: What have you got planned for the upcoming Bheki tribute at The Forge? GL: The first set will be all my stuff with my new Grooveyard line-up, then in the second set a great bunch of horn players will be joining us to make up a nonet to do justice to a whole bunch of Bheki’s material – some will be reworkings of his more familiar tunes, plus a few lesser known ones. I’ve never heard these tunes done by a larger line up – basically I’ve got a huge pile of pencil on paper lead sheets that I transcribed when I was immersed in Bheki’s world. I’m really only just starting to put these unknown tunes out there – for a while after his death it was just too painful to dig these tunes out and work them up. The 2014 EFG London Jazz Festival is an exciting opportunity to revisit them and re-present Bheki. I’ve been doing a project with my postgraduate students at Trinity as a dry run and it’s been going down really well. I’ll be trying to present his material in the way he would like, so basically in scaling it up for a bigger band I’m trying not to mess around with the tunes too much – just keeping close to the textures and the voicings he intended. I always promised myself I would never do anything half-baked by way of a tribute, so hopefully this will be a big, worthwhile celebration of Bheki Mseleku’s immense talent. 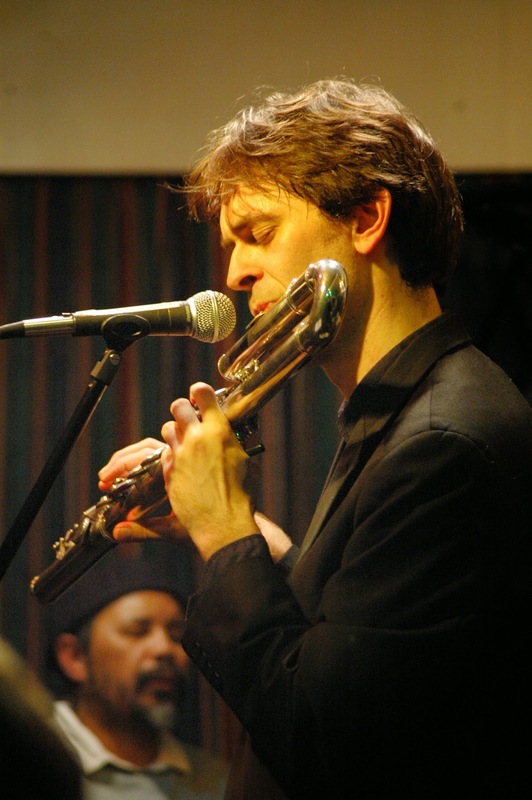 Gareth Lockrane’s nonet will feature Ross Stanley on keys, Dave Whitford on bass, Tim Giles on drums, Miles Bould on percussion, Steve Fishwick on trumpet, James Allsop on baritone sax and bass clarinet, Barnaby Dickinson on trombone and Alex Garnett on tenor and soprano sax. Gareth Lockrane is doing more than anyone to ensure that the legacy of my beautiful brother Bheki Mseleku lasts beyond the most distant star in the universe of creative music. Well done, Gareth! Thank you for sharing these scribes. His music will live long and be enjoyed by so many spirits.